Today’s guest blog is written by Tim Magner. He is a children’s book author, food educator and dynamic teacher. While visiting more than 100 schools as a children’s book author, Tim got an up-close look at what kids were eating. 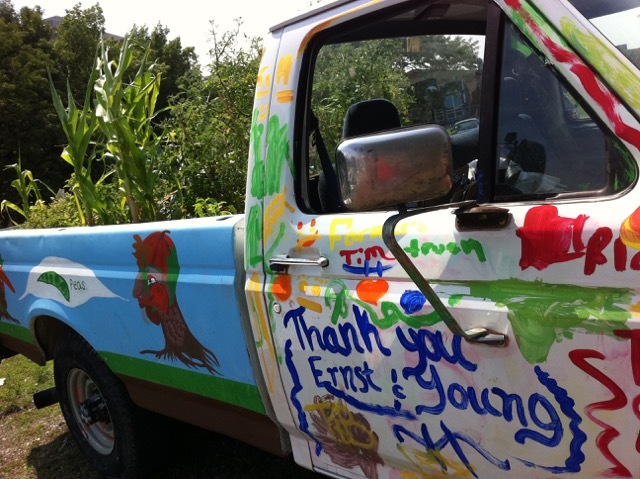 He created Truck Farm Chicago, a farm-on-wheels project that connected kids to food for three years. Currently, he’s Camp Director at Nature’s Farm Camp and his cooking partner with The Kids Table. Tim hails from Chicago’s North Shore and also taught skiing to kids in Colorado, golf in North Carolina and was a camp counselor in Georgia. He’s tutored with several organizations, served on a Local School Council and was a board member at The Academy for Global Citizenship. “What do you mean they were domesticated in Central America. I thought tomatoes came from Italy?,” said a nearby student. From another kid a few minutes later reading the ingredient list: “Ferrous Sulfate, Thiamin Mononitrate, Riboflavin, Folic Acid,…” Even though the student had eaten Flaming Hot Cheetos as a daily ritual, the words came out awkwardly. Note: it takes several minutes to read the entire ingredient list. 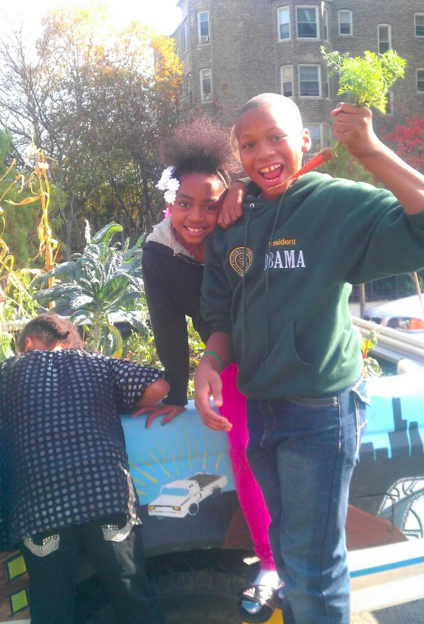 We had brought Truck Farm Chicago, our bio-dieseled power farm-on-wheels for a few lessons. Often, pulling out of the school parking lot, we’d debate, “Is it right to ask the kids to make better food choices when the odds are stacked against health?” Despite an uproar from parents and community members who care about health, ‘cheap’ pizza and fries (loaded with fat, sugar and salt) remain the de facto choice in cafeterias. For many, nachos and cheese are the breakfast of choice. When chips and soda are ever present (and just pocket change), what is a ten-year-old going to choose? Kids consume empty calories, processed food from the industrial system because it’s ‘cheap,’ nearly addicting and brilliantly marketed. The costs, like pollution, toxins, and diet-related diseases such as diabetes and hypertension are ignored, or come later. It got me thinking. In an ideal world, good, clean, fair food would be the de facto choice. 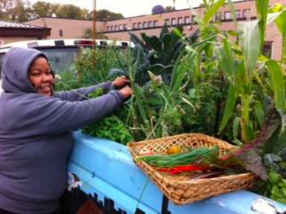 Schools would source directly with local farms. The kids would know the farmers and vice versa and food would be integrated into their education, as opposed to on the side and separate from their daily subjects. Outside of school, families would have the time, energy, skills and money to cook. Each meal would support the health of people, economies, communities, and ecosystems. Potlucks would happen all over the place! Was I dreaming? Clearly there are obstacles, but what about an interim solution that would help remove obstacles and create leverage to make change? Could we create a place that showed what’s possible? So, Nature’s Farm Camp was born. It’s a chance to fully immerse kids in all things food. A summer camp where food is at the center of programming. Where delicious, nutrient-dense local food is the de facto. Where kids craft each meal and get to explore different tastes and textures. The classroom is the kitchen and so are the farm fields (and so are the forest and the creek, where the kids roam and explore). We welcome children from all over Chicagoland, offering scholarships and financial aid to as many as possible. 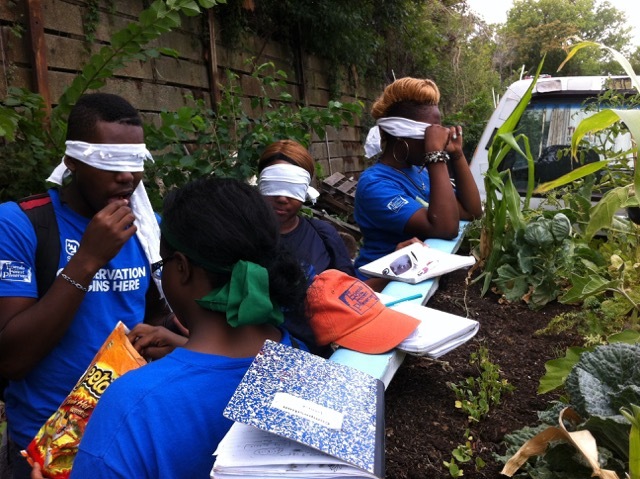 We’re only embarking on our 2nd season of Nature’s Farm Camp, but have begun talking with other summer camps about how to integrate local, nutrient dense food into their food service. Better yet, the USDA hired a full-time staffer who’s sole responsibility is evolving and growing the farm-to-school program for the Midwest. Whoo-hoo! Here’s to making awesomeness for all kids the de facto!